Some fun updates – our podcast GlobalFromAsia was featured in Shenzhen Party.com the other day alongside another good friend JP’s Chinabusinesscast podcast. Thanks for recognizing our podcasts and promoting them on the show – I have a feeling the owner, Brent Deverman was the man behind the scenes making that one happen as I know he is a regular listener – so thanks for that Brent! 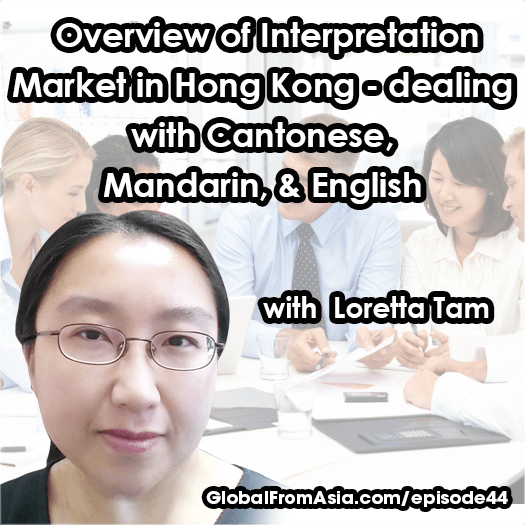 So now for the show – we have Loretta, also known as Retta, Tam from ACLS language and training solutions in Hong Kong giving us an overview of the translation industry in Hong Kong so let’s listen in. We’ve had so many podcasts and still haven’t discussed yet translation and interpretation. I have to be honest , I am bad at foreign languages – I think I’m a spoiled American who got away with dealing in English my entire child life. Being in Hong Kong and overall Asia, its a necessity to deal with all kinds of languages – with Cantonese, English, and more and more Mandarin inside Hong Kong – 3 languages is overwhelming. – InterpreterWhat are they, are they the same, what are the differences? And then when a business needs help in written and spoken – these are different specialities right? And from one “direction” to another “direction” are different right? For example, someone may be good at doing English to Cantonese, but not as effective the other way around – Cantonese to English? If a business person is traveling to Hong Kong or China for a trade show and visiting businesses and factories – they may need one of these services, or all? Can you help listeners decide what service they may even consider needing? Tour guide is completely different of course right? But many times, this can overlap or? And business tour guide exists? It’s not just for pleasure travel right? Everyone always talks to me about translating their website to Chinese – what do you suggest? And then a big one – is their personal name and their company name being translated to Chinese – what do you suggest here? Dealing with a freelancer or agency? Should they hire this as a full-time position – in a Chinese assistant for example, or are there times when they should have an expert outsider and then a full time assistant for different issues? How about for legal? A lawyer, or how to get a document translated – what is your suggestion? Thanks so much for sharing – for those listeners interested in these services, would be great if they can use you – how do you work, and how can people reach out to you ? Thanks Retta for sharing, I hope some listeners reach out to her for her services, she seems very on top of things and really did a lot of preparation for the show – so thanks again! Next week we will have Dave Chung from Cyberport on the show – which is an amazing facility in Hong Kong to support technology and innovation and has a lot of programs for listeners to apply for – both financial and in other amazing support services – so catch you next week! Retta Tam – ACLS Language and Training Solutions Retta is a linguist and anthropologist by training, with a PhD in linguistic anthropology and ethnic politics. She’s also a qualified TESOL (Teaching English to Speakers of Other Languages) and TCSL (Teaching Chinese as a Second Language) teacher. Being Eurasian and having lived on three continents, she is currently running her language consulting business specializing in translation, verbal branding, and corporate communications. What are they, are they the same, what are the differences? The definitions do overlap each other. All of these terms refer to people working with languages, and “linguists”, in a loose sense, an umbrella term covering both translators and interpreters. CIOL (Chartered Institute of Linguists) in the UK is a good example of employing the term for referring to such professionals. In the academia, we tend to regard “linguists” as experts in language science though. As for “translators” and “interpreters”, the former term refers to language professionals specializing in written translations. Most of my fellow “tribesmen” are translators by nature. “Interpreters”, the latter term, goes to those language professionals translating verbally for a range of formal contexts, such as meetings and press conferences. In the Chinese-speaking world especially Hong Kong, people tend to mix up these terms and you may hear locals say “we need a translator for this conference”. OK, let’s face it, this is Hong Kong English, an emergent variant of English in East Asia. 3. And then when a business needs help in written and spoken – these are different specialities right? Yes there are. The range of specialities are impressive. There are a few indispensable specialities that everyone in business will come across, such as Corporate, IT, Legal, and Advertising/Marketing/PR. These days with the paradigm shift, it’s no longer easy to tell advertising, marketing, and PR copy apart, which explains why we see all these slashes. There are also a good number of specialities focusing on a particular sector or discipline, such as medical, engineering, and aerospace. Take myself as an example, I am a translator specializing in Arts & Humanities, Education, and Advertising/Marketing/PR while being competent in both medical and linguistic validation. Every translator or interpreter has their own strengths and weaknesses. 4. And from one “direction” to another “direction” are different right? For example, someone may be good at doing English to Cantonese, but not as effective the other way around – Cantonese to English? You can say that again. Accuracy and fluency are both key to delivery of quality translation and interpretation, which is why most of us translate from a second or foreign language into our mother tongue. It is based around the hypothesis – or belief – that we do best in our first language. Anyway, there are so many bilinguals and polyglots doing two directions or even multiple languages. It’s pretty common in Hong Kong. 5. If a business person is traveling to Hong Kong or China for a trade show and visiting businesses and factories – they may need one of these services, or all? Can you help listeners decide what service they may even consider needing? Hong Kong, as a Chinese Special Administrative Region and former British colony, has a set of rules – and hidden rules – different from Mainland China. I’d suggest businesspeople coming over to Hong Kong for trade show or site visits to hire an experienced local business interpreter. Send inquiries to a Hong Kong-based translation agency, state your needs and ask them for a quote. Never go to an undergrad or postgrad from Mainland China who eagerly offers to help with the interpreting matters. Besides the cultural and language differences, it is illegal for current non-local students on student visa to work in Hong Kong without special permissions. The same maxim applies to the case of Mainland China, but the situation is far more complicated than Hong Kong. It all depends on which city or province you’re heading to. The southern provinces are generally more protective of their own tribe, which means it’d be a good idea for you to hire a local business interpreter speaking the regional dialect while knowing well your culture. If you’re going to the borders, such as those autonomous regions for ethnic minorities, hiring someone speaking the minority languages will be a plus. Contact a prestigious translation agency or business consultancy in a major Chinese city for recommendations and quotes, and request for a brief teleconference with the candidate before confirming your booking. Let me share with you a Mainland example. A Korean friend of mine once hired an ethnically Korean interpreter born and raised in China for a trip to Jilin Province in northern China. Her supplier was Chinese, and her bilingual local guide actually helped translate both the Chinese language AND culture (well, I mean the “hidden rules”) into what an average Korean can understand. My friend ended up getting the best bargain – thanks to her local guide’s brilliant negotiation skills in both Mandarin and the regional dialect! 6. Tour guide is completely different of course right? But many times, this can overlap or? And business tour guide exists? It’s not just for pleasure travel right? Apparently tour guides don’t do business the same way as interpreters. In Hong Kong, there is a licensing system for tour guides but not interpreters. So funny, eh? Anyway, tour guides might as well serve as local guides but not necessarily business interpreters. Business interpreters play an important role in closing deals with potential local partners, but tour guides are simply not trained in helping with business talk. We’d have to be very careful when it comes to the terminology. There are a good number of self-proclaimed “business tour guides” in Hong Kong. They plan and organize specialized trips and site visits tailor-made for various industries. A lot of them are freelancers, and it’d be good news for those of you who need a personal business tour guide. Their quality of service varies, but you can always request a voice chat before booking confirmation to see if he/she sounds fine. I won’t suggest hiring freelancers for group visits though, as they are apparently less resourceful than agencies. You might wish to go to a local (and again long-established) travel agency for inquiries instead. Quite a number of boutique travel agencies in Hong Kong offer customized group tours for businesspeople. Always double-check the registration status of your potential business tour guide and travel agency to avoid disappointment. 7. Everyone always talks to me about translating their website to Chinese – what do you suggest? Translating a website to Chinese, as we know, is different from translating a text or manual. We need to locate the right market and target them with THEIR OWN variant of Chinese. That’s why we need localization experts, that is, translators with an expertise in translating not only the language but also the culture and technical details. Businesses often get confused at the initial stage by hiring novice translators from a different Chinese speaking market to do the job. It’s a BIG NO-NO! 8. And then a big one – is their personal name and their company name being translated to Chinese – what do you suggest here? I’m not a fan of personal name translation, but I admit it’s a gesture of friendliness pretty well-received in Hong Kong. Translating personal names into Chinese is the job of senior secretaries in any local organization, unless you have a very creative local client who might bother to think up one for you – ta-da, quality not guaranteed Your Chinese name should sound fine in both Cantonese and Mandarin. If you don’t have a local secretary or creative client, I’d suggest setting aside this idea. Chinese folks don’t really care if you have a Chinese name or not, unless you speak very good Chinese and they might be tempted to ask if you have a Chinese name to prove your love for their language. That being said, it doesn’t mean too much if you only have a Chinese name and not the language as well. As for company names, the big boys hire branding agencies to do the job. If you’re on a slim budget, try a translation agency with verbal branding experts. Naming is getting to be a very specialized area in which linguists, hopefully with anthropological training too, evaluate names nominated by either the client or the branding team in terms of the target markets and languages. 9. Dealing with a freelancer or agency? It depends on your needs. I’d go to a freelancer or a boutique agency for highly customized and specialized services, and bigger agencies for large projects presented as company milestones. Budget is of course another factor affecting our choice. 10. Should they hire this as a full-time position – in a Chinese assistant for example, or are there times when they should have an expert outsider and then a full time assistant for different issues? I’d say the latter proposal is the most viable and flexible option, especially for startup entrepreneurs and small businesses. In both Hong Kong and Mainland China, assistants are predominantly young and inexperienced. They might as well be smart, but one can’t expect a local assistant to be an all-rounder. So why not outsource the professional jobs to expert outsiders and save the routine tasks and errands for full-time Chinese assistants? It can save you a lot of time and money too. 11. How about for legal? A lawyer, or how to get a document translated – what is your suggestion? Legal translation is a tricky thing in Hong Kong, as we don’t have this sworn translator system. My suggestion is hiring an experienced legal translator with a local LLB or LLM to work on company registration paperwork and Terms & Conditions, PLUS a lawyer for verifying translations of important contracts and agreements. Play it safe and avoid the fuss! 12. Thanks so much for sharing – for those listeners interested in these services, would be great if they can use you – how do you work, and how can people reach out to you ? My team and I can be reached via email at [email protected] As a boutique consulting business, our account service has gone entirely online. We deliver translations, creative copy, presentation decks and reports via the internet, whereas requests for hard copies and on-site consultation are also well taken care of.